A heavy blanket of darkness still covered the valley. 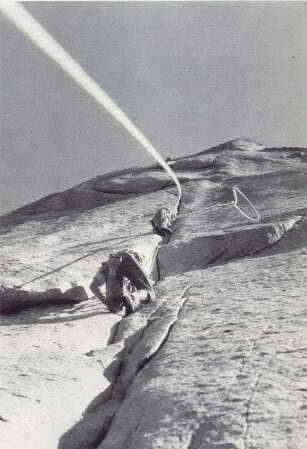 The brisk air nipped at my neck and cheeks as I flaked out our ropes at the base of the wall. I pulled up the hood of my fleece in an effort to ward off the chill. It was early morning of October 6th. The previous day Adam and I had lugged our overstuffed haul bag up the fixed lines to Heart Ledge. While we generally try to avoid fixing and hauling separate from our ground up push on a wall, the idea of trying to wrestle our bag (packed with 5 days of food, water, and gear) across the low angle and highly traversing terrain of those first ten pitches seemed heinous. Working within the small bubble of light our headlamps provided, we started up the first pitch, 3,000 feet of steep granite looming over us. The contrast between the light of my headlamp and the surrounding rock became increasingly subtle as the sky slowly grew lighter; just in time to navigate the blank slab, that, like an ocean, separated one crack system from the next. Unhindered by the weight of our haul bag, we climbed quickly and soon found ourselves on top of Mammoth Terraces. A quick rappel reunited us with our haul bag on Heart Ledge just in time for a noon lunch. Two additional pitches would land us on Lung Ledge, our original target for the first night’s bivy. With extra time on our hands, we pushed upward, completing the infamous Hollow Flake, however, as we began hauling, climbers began raining down on us from above. Like spiders sliding down a string of silk, one after another they slid down our ropes, their ropes… back on our ropes. Progress came to a halt until the last climber slithered past me out of sight. Pause returned to play, and just like that we resumed the wrestling match – lowering out the haul bag and dragging it onto Hollow Flake Ledge. The fiery sun fell behind the horizon just as we settled in on the Hollow Flake Ledge for a comfortable night. Adam and I woke up with the sun. Our haul bag looked slightly less robust after a night of eating and drinking, but still felt seriously overweight. A morning of climbing led up right to the base of the Ear, a Bombay chimney created by a large flake. The chimney starts out wide and slowly pinches towards the top until you’re forced to traverse sideways out of the chimney and up over the side of the flake. Adam started up the chimney, soon becoming engulfed by the flake and lost from sight. He placed a number three cam in the crack, wondering if I’d be able to clean it because of the massive pendulum it would require all the way out of the chimney to the next piece he would be able to leave. 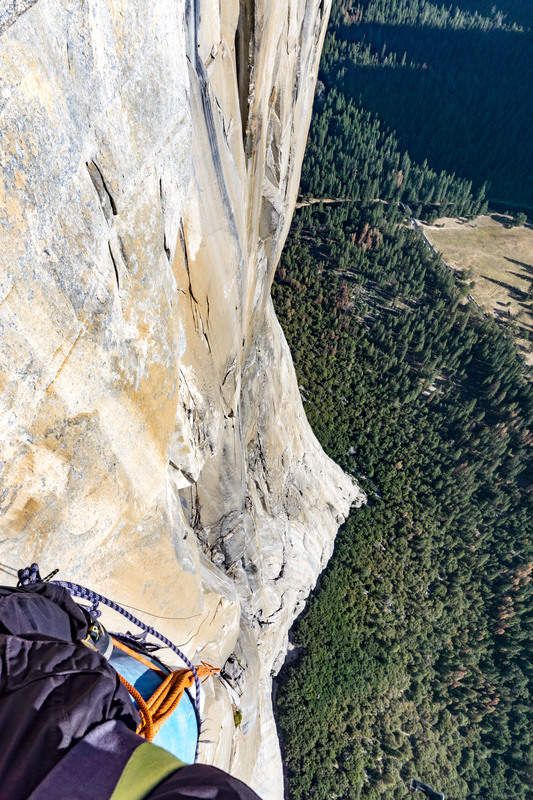 Most climbers don’t leave any gear behind on this pitch so, upon reaching the top of the flake, they can flick the rope over top of the flake, creating a clean line for the second to ascend. I assured him it would be fine, even though the placement was out of sight. 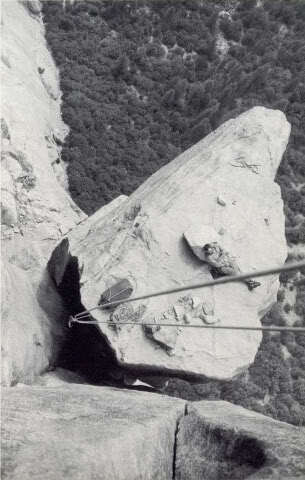 The rock looked low enough angle to tension traverse out of the chimney, however, upon reaching the placement the rock angle no longer looked low angle. The rope angled sharply from the cam across the chimney and out of sight. It would be a clean swing, but the exposure felt real. I put on my GriGri and took off my ascenders, then got into a good stance to remove the cam. My hands began to sweat as I took a deep breath and cut loose. A squeal escaped my lips and the party below us began to hoot and holler as I was spit out from behind the Ear, swinging onto the blank face beside it. High on adrenaline, I joined Adam on top of the Ear and we continued upward. 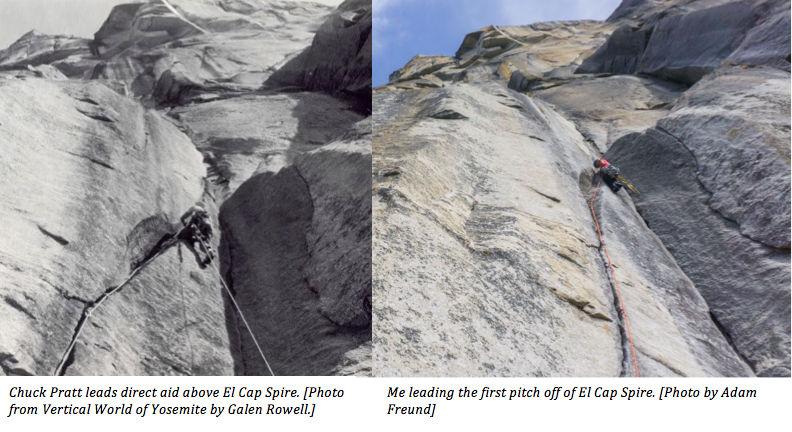 Darkness was creeping in, just as we collapsed onto El Cap Spire, exhausted from the long day of climbing. The magic of being on a free-standing spire, 1,800 feet up the wall, took the edge off our sore bodies. Sleep came easy. Our third day on the wall came with decisions. 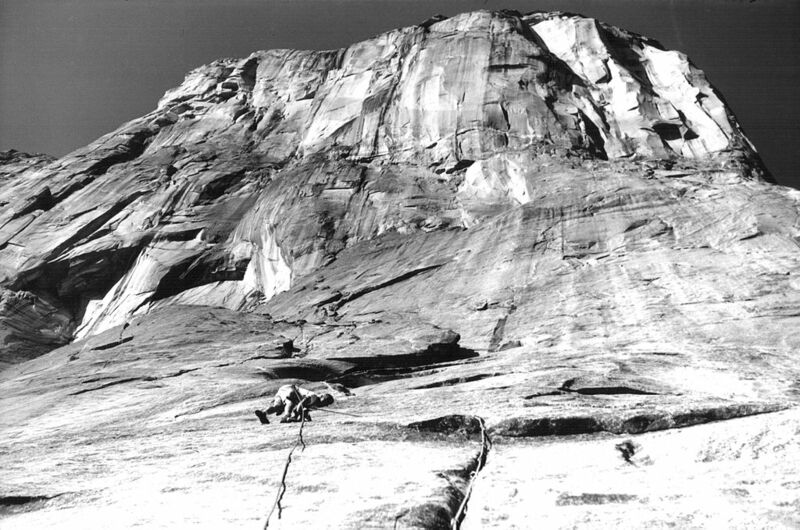 We had planned for an easy day of climbing to the Block, a bivy ledge only five pitches off of El Cap Spire, however, another party was planning to spend the night there. We could either up the mileage to make it to another bivy ledge higher up, or we could spend a second night on the Spire. Our tired bodies happily accepted a day absent of hauling. We slept in late that morning, lazily lounging in our sleeping bag until the hot sun forced us up and moving. We spent the day fixing all the rope we had up the next five pitches, to the anchors at the Block. 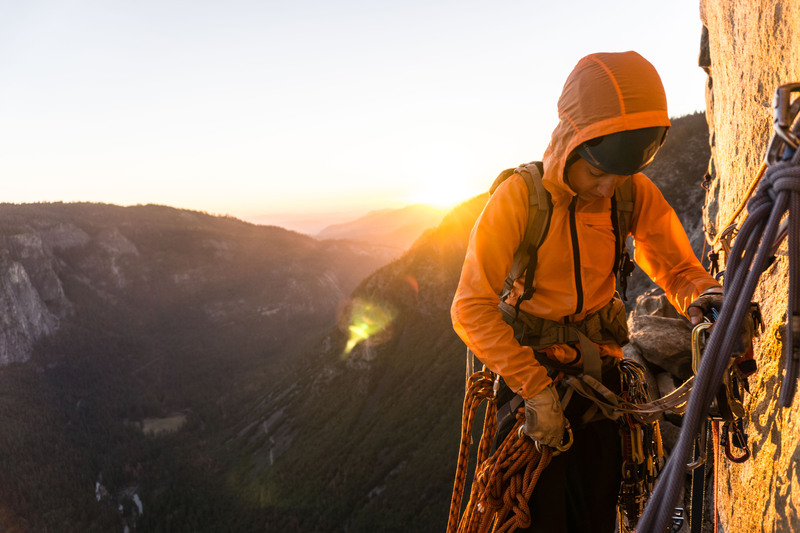 As another day came to an end, we rappelled back down to the comfort of the Spire. The morning of day four, our haul bag felt significantly lighter. We beat the sun to rise, blasting up our fixed lines, haul bag in tow. Sunlight greeted us as we started climbing, crossing a series of pendulums before continuing upward once again. Like a rigid jawline, a giant roof jutted out above us, guarding the steep upper Headwall. Adam traversed out under the roof on wildly exposed terrain. As I followed up behind him I was keenly aware of the empty space dropping out from beneath my feet. 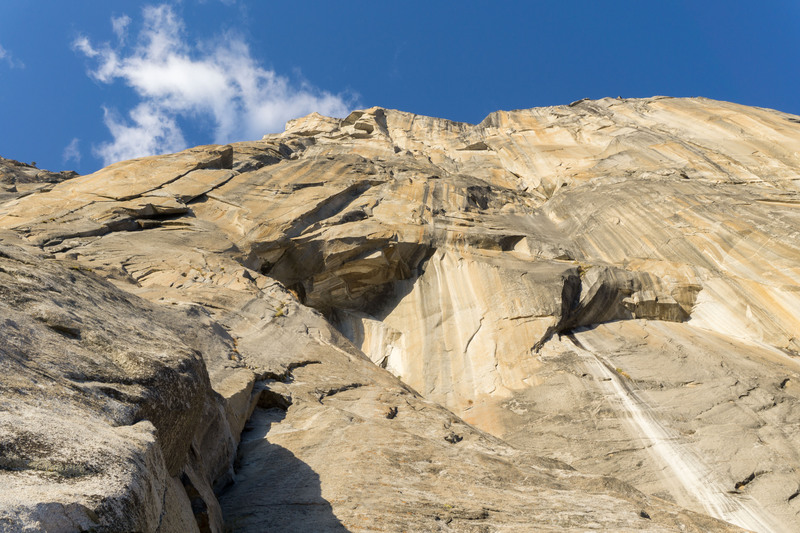 With each piece of gear I cleaned, I hung farther and farther away from the wall, until I finally pulled the lip and reached the belay at the base of the Headwall. 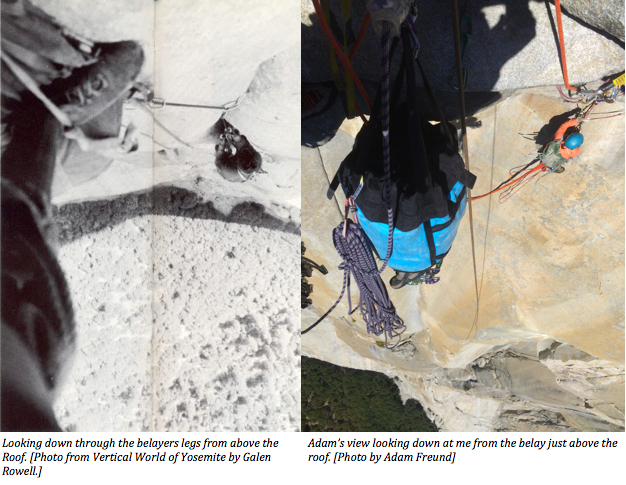 I sat on the haul bag as I belayed Adam, the wind rocking the bag and I back and forth like a small boat out at sea. Our ropes were alive, twisting and slithering vertically through space. 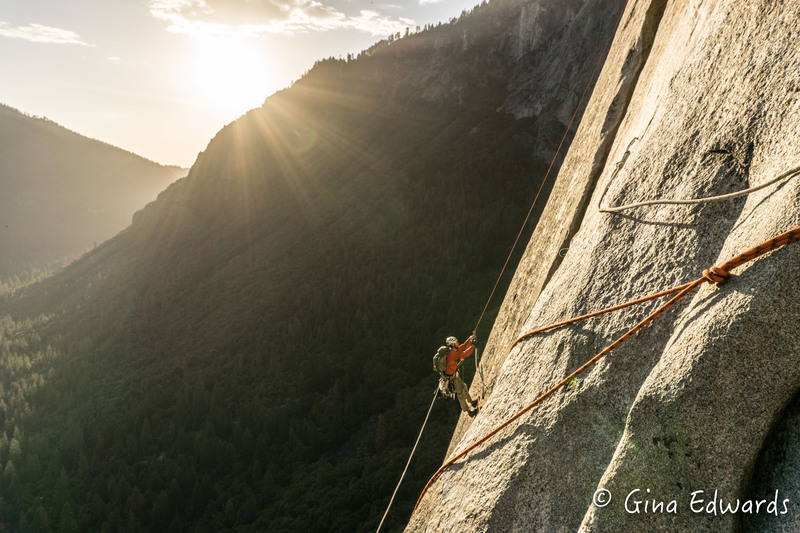 Fiercely golden light sprayed across the granite wall as we pulled onto Long Ledge, just above the Headwall. As we pulled out dinner for the night an intense whooshing of air grabbed our attention – a wingsuit BASE jumper flew past the ledge and, like a raven, elegantly glided along the wall, lower and lower, until he turned the corner of the Nose and was out of sight. While only four pitches separated us from the summit that morning, we knew better than to think it would be an easy trip to the top that day. El Capitan doesn’t relent; she guards the top well. So we cast off from the ledge early, making our bid for dirt grounds. The sun blazed hot as we pulled over the final steep section of rock and dumped our bags under the tree marking the end of the route. While reaching the top seems to be an appropriate place for celebration, a climatic end to a great journey up a massive piece of stone, it never seems to be for us. It’s merely the end, with many pinnacles of excitement, celebration, and physical and emotional strength strung between the ground and the top. And I thought driving on 95 during rush hour was wild !!! !